A lot of the promotional material I've seen don't show a lot of people walking about in the daytime, unless people's clothing seems to indicate the pics/video were taken in the winter. Do most people hide indoors during the summer temps and humidity? Would I likely be in a vitual ghost town and not see my neighbours during the summer daylight hours? Would I have to get up at dawn to golf or walk to beat the daytime heat? And, how does everyone handle being covered in inspect repellent 24/7? Excellent question! Although your Northern neighbors will be jealous of you in the winter, there is no hiding the fact that the summers can get very hot. 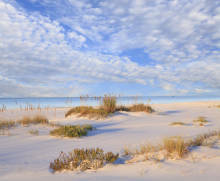 However, Sarasota's gulfside location offers a breeze which is hard to find inland, bringing the temperature down a bit. Even in the middle of summer, you will still find the community out and about!